Get your sponges and a bucket of water at the ready for the wet sponge toss. Nominate your favourite teacher to take to the chair. Students get ready… aim…. and throw! Just fill up an empty jar with pink and white sweets – lollipops, jellybeans, milk bottles and teeth and lips… you name it, just don’t forget to count them when filling it up. Have a guess sheet ready and your thinking caps on to guess the number of sweets inside. The closest guess wins the jar! Bingo works great in classrooms and as a school, so why not get everyone involved! You can even give it a pink theme with some pink pens and pencils and our pink bingo cards you can download from our website. Everyone loves a good raffle! Fill your prize selection with crowd-pleasers like sweets, chocolates and pamper products. You could even ask the bosses to donate some money for some enticing big prizes, or even some ‘money can’t buy’ gifts like an extra day’s holiday – your colleagues won’t be able to resist! You can’t beat a good quiz, so get your colleague into teams and test their knowledge. You can even have prizes for the winning team to add some friendly competition! 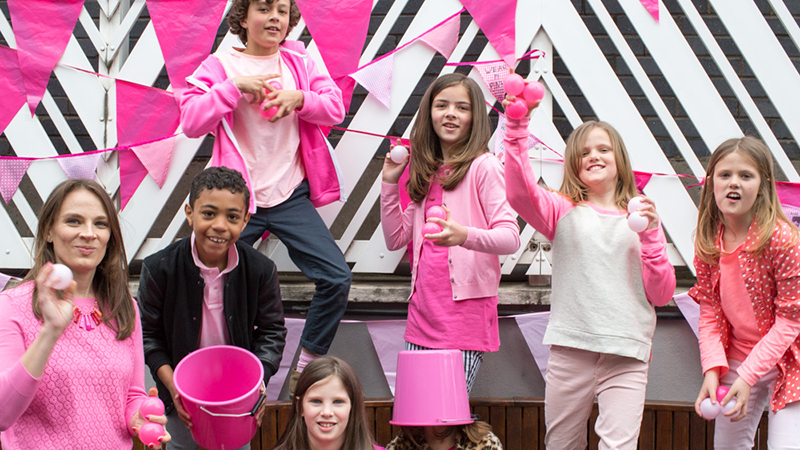 Create your own quiz or head to our download page to download our big pink quiz sheets – there’s something for everyone! Bingo is great no matter the age! Head on over to our downloads page and print off some pink-tastic bingo cards, get your dabbers at the ready and even throw some prizes into the mix to get everyone equip to play. This game is great for a dinner party or gathering. Pick a word or a few that your guests can’t mention (the more common the better), and each time they do, they add a donation to the jar. This is a super easy game to organise- all you need is a bowl of water and a lemon! The aim is to see if you can balance your coin on the lemon in the water (which isn’t as easy as it looks). If the coin falls in, its gets added to the donation! A treasure hunt is lots of fun and a great way to raise money. Place prizes around your event location with clues along the way and invite your guests to pay to go on the hunt…. Great for all the adventurers! Visit our fundraising ideas page for some inspiration, or get in touch with us at wearitpink@breastcancernow.org - we always love to hear from you! If you’ve played an amazing game that helped raise loads of money, tell us about it and we can add it to our blog!